Just a few days ago, I went to a Killing Field. The name itself seemed ominous. A Killing Field. Kill-ing. Field. How did a field come to acquire such a macabre title? There was a haunting rhythm to it, the way the syllables rolled off one's tongue. 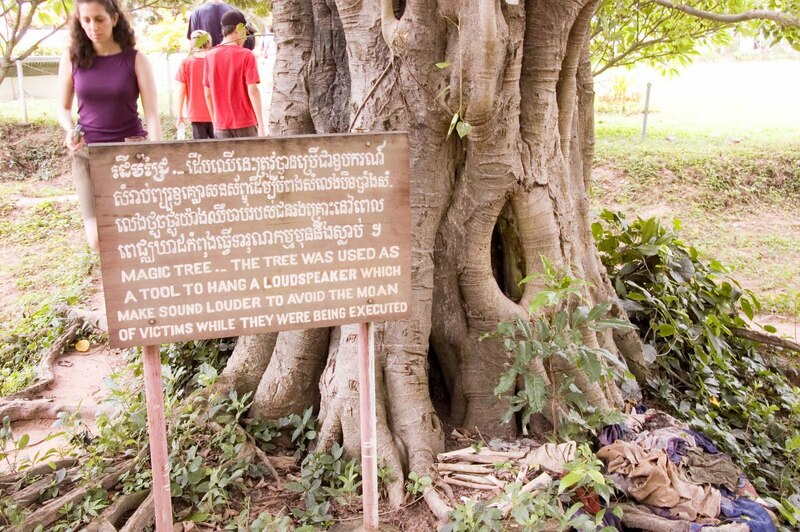 This memorial laid on the outskirt of Phnom Penh. Beneath its soils, there weren't any precious jewels or minerals or truffles. There weren't caches of Roman coins or deposits of black gold. There were only splinters of a fractured past. In the middle of the memorial, a stupa - a glinting tower - stood erect against a sky of dainty clouds. In it, there were shelves upon shelves of skulls. Hollowed sockets. Cracked craniums. Rags. It was sobering to be stand there, to watch and wonder about the life of these people. How cruelly they were ripped from their lives. The torture they were subjected to. The blood dripping slowly from necks cut with sharp leaves. By myself, I wandered. I was gripped by a sense of horror. The sheer magnitude of pain, the banality and cheapness of life. Kept envisioning what those skulls would say. Grey. Dusty, sand-covered. Spidery cobwebs drifted between these skulls. Their unflinching gaze confronted. In a daze, I stepped on a mass grave. My classmates were horrified. They warned me to get off quickly, to let the dead rest in peace. 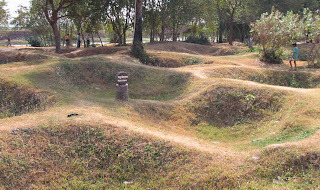 Then, my lecturer said that these pits were just random places where the Vietnamese chose to dig. All around, every inch of soil that we stood on, they all harboured human remnants. Those bones fragments were peering out of baked earth. They were like plants, slowly unfurling tender shoots. Rainwater washed away the dirt. Footsteps smeared away the dust. These splinters, they slowly showed themselves. They emerged, fresh from the ground, to remind us of the stories we forgot, the histories we repeated. This was one of those times when I struggled with words. These configurations of alphabets, they simply just couldn't do justice to the sheer destruction. It couldn't describe the haunting atmosphere, nor the wispy breezes. 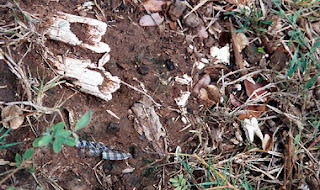 It couldn't describe the butterflies weaving throughout the killing field, nor the chickens pecking at the troubled soil. It couldn't describe the verdant plants, growing strong on a field of blood. It couldn't describe the lackadaisical attitude of some tourists, of them checking tiny squares on their things-to-do-in-Cambodia list. It can't describe the feeling of standing on bones. "This place, it doesn't belong to us. We are here and we exercise our collective intelligence. We analyse and criticise and feel sad for these people. But we won't really do anything about it. We have no rights to be here. Tourists come here and ooh and ahh. But this place, it doesn't belong to us. It belong to the people of Cambodia." "But... even if we don't take immediate concrete actions, we can learn from it. We can learn what happens when we cede our freedom, thinking that giving up a little isn't a big problem. Perhaps, one day, when we are confronted with injustice, we'll draw on this experience and strive against it." Once, I teased my friend for choosing to major in History. She was offended when I jested that history was about past events and dead people. As with so many other things, I was wrong. Wholly, utterly wrong. History has vital lessons to impart. It teaches us to coexist in peace. It reminds us of the brutality of conflicts. It points the way forth. Let these tragedies not be mere blips.